One of the drivers for the work we have been doing at Adur & Worthing is to get to a point where we have good quality, readily accessible data. We are building and maintaining lists or registers which we hold once in our platform and use many times in a range of digital services. These key registers are our properties, other asset types, staff, customers and organisations. We believe that the highest value service data is that which is created as a product of people doing the work, not as a product of sitting down on a Friday afternoon and typing stuff up. Keeping key registers accurate is a close interplay with day-to-day operational services that are constantly editing them, changing an address, replacing a boiler, adding a mobile number etc. It has to be dynamic and real-time. We’re a long way from it for some registers, but in others we’re doing well. I spent a number of years working for the East Sussex Youth Offending Team and then Brighton & Hove Children’s Services on information systems, data and performance. I also worked corporately at Brighton & Hove on local information systems, mapping national datasets like the Index of Multiple Deprivation together with more local data, helping build up patterns of higher need at neighbourhood levels. All good stuff, but after years of this well-meaning work, the conclusion I came to was that the whole system was built on badly lagging data, which was either not trusted or falsely reassuring to decision makers. There were so many conversations about ‘meaning’ and data quality — it became a real drag, and it was clear the data was not driving decision making at all. The problem, I reluctantly concluded, was that with many important datasets (like children’s social care), busy officers were generally asked to record the least interesting data well after the event. It was just too easy to fudge information like completion dates, and more complex forms were at best partially completed and data gaps had to then be laboriously chased up by administrators to feed government returns. All this still goes on a lot, and the new Homelessness Reduction Act is another sign that this way of thinking persists in policy-making. I decided some years ago that this whole data thing needed to go on hold for me, and that I would try to work on properly redesigning and digitising services before looking again seriously at data. Only when people are operating digitally day to day, using well-designed services, will the right data be collected at the right time. That’s why I’m excited by the work we are doing on asset management at Adur & Worthing. We have created an asset register on our open standards platform with a clear architecture, made available to a growing number of digital services that are helping maintain the register in real time. Our housing repairs app is helping us receive repair requests from tenants, send out operatives, keep everyone informed, calculate drive time (Google), record tenant satisfaction and even raise invoices on contractors. All fantastic stuff. But it also helps us maintain accurate records of the assets attached to our social housing stock like boilers, windows etc. in a canonical asset register. Our estates app is doing the same for the commercial properties in the register, and our compliance app, currently in production, will do the same for various inspection and test data across our assets. As we move forward, the asset register will support other categories like vehicle fleets, IT equipment and sensors etc. using the sensible architecture of ‘nested assets’, e.g. sensor A attached to boiler B in property C.
The point here is that the asset register sits separately from the apps that interact with it. The operational apps are the things that keep the asset register totally up to date and achieve the required level of accuracy and trustworthiness, allowing us to do clever forecasting for capital programmes, demonstrate compliance on-the-day and deliver many other insights. Having an accurate and open standards asset register also means that other digital applications will be able to access information through secure APIs going forward, opening us up to innovations from digital companies large and small. Adding sensors and sensor data to assets in the register via a LORA network and IoT platform is something we’ve already started to explore and test. We’ve also got some powerful benefits coming from having our staff register on our platform. When a maintenance operative books their annual leave corporately, they are automatically made unavailable for housing repairs jobs in the repairs booking system. Allocating work to anybody in any platform app is done using the staff record in the register. If a staff member leaves, all their allocated work remains attached to the post and is therefore already allocated to the new post-holder when they join. We are also hoping to apply this thinking and go much further with our local community service directory through our MHCLG Local Digital Fund bid, working with several partner councils and the Open Data Institute. We want to explore what it could mean to create a canonical data register of local services that a wide variety of digital applications can consume. The ability to more accurately assess provision in a place through analysis of an up to date and detailed local service directory would be a real breakthrough. 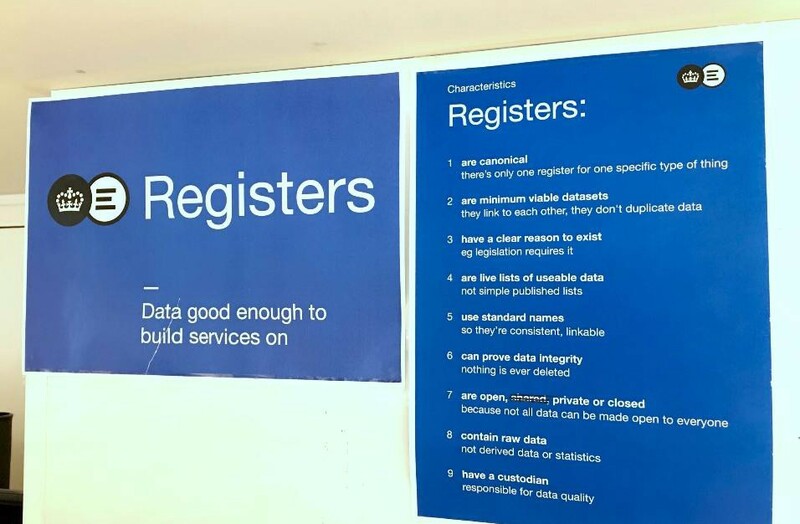 Creating consolidated, canonical data registers is a really vital strategic play, and it’s crucial that these are conceived of as separate to the digital apps that help maintain them. These open data registers will help drive trustworthy analysis and a new culture of evidence based decision-making. They will also help enable ecosystems of applications to flourish around them, particularly if data standards are agreed nationally through MHCLG Local Digital Fund projects. I’d be really interested in views around this, and further opportunities to collaborate.